All students are on their honor during examinations and in the preparation of written materials such as exegesis, research papers, reflection papers, book reviews, etc. Students are expected to give accurate and explicit indication of the citation of any and all materials quoted or paraphrased from other sources. Any student who publicly dissents from the doctrine and authentic teaching of the Roman Catholic Church may be dismissed from their academic program. Plagiarism is the use of the ideas, words or other products of creative activity of another person, living or dead, without proper acknowledgment. It applies to words, music, visual arts, spoken words, scientific research - all products of intellectual activity. 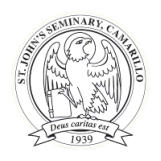 Academic integrity is essential in maintaining the reputation of the individual student as well as that of the institution of St. John’s Seminary. Students and faculty are required to acknowledge the work of others in their writing and in their oral presentations. Failure to do so is either an act of intentional dishonesty or the result of ignorance of the practices of scholarly research. As future leaders of the Catholic community, our students are expected to exhibit moral integrity in all they do. Plagiarism is not just a violation of academic protocol; it is a serious formation issue. of academic dishonesty. In any case, the Seminary will keep a record of any such infringements in order to monitor repeated offenses. Once each term, the librarian and the director of the writing center will offer workshops on how to avoid plagiarism by correctly citing sources according to the MLA standards. Students who test at the novice level on the language evaluation test given after admission will be required to attend the workshop, along with any students who have exhibited in their course work a lack of knowledge of academic writing standards. The professor who has cause to suspect plagiarism should first report the incident to the dean. the student on the assignment or require that the paper or project be corrected and resubmitted. Determination of the final grade is also the professor’s prerogative. In serious cases, the professor may decide, with the approval of the academic dean, to fail the student and require that the course be retaken. Instances of suspected plagiarism should also be reported to the student’s formation advisor. The incident and the student’s response should be documented and kept on file in the dean’s office. A second occurrence of plagiarism will result in more serious consequences to be determined by the academic dean, the individual professor and the relevant formation advisor.